OK, I again promised to do some teaching here. 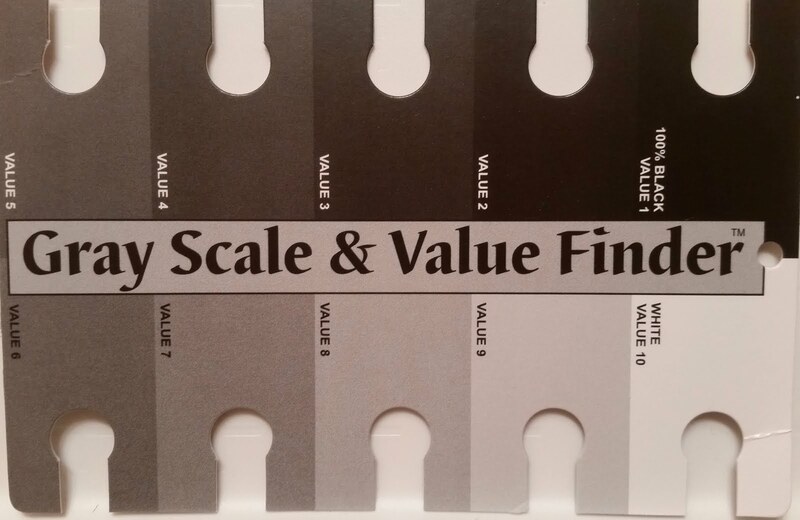 Last week I showed you a photo of a VALUE FINDER also known as a GRAY SCALE. This is a very important tool to the artist. In order to have believable paintings you MUST have proper value in the painting! It is how you establish depth. If you look at a scene, photo or real life, you look off into the distance and everything has a bluish tint. That is the effect of atmosphere. Air particles make distant objects look blue. Think of the "Blue Ridge Mountains" and you get the idea. Look at a picture of them and, yes, they look blue. It's funny, all mountains look that way, but they do appear more blue I have to admit. Anyway, when you paint you use the VALUE FINDER to help establish the proper distance. When you get used to using it, you can do it almost automatically. But, don't throw it away because there are times when you will want to refer to it if something doesn't seem just right. It will help correct mistakes. Now for how to use it! I have again posted the picture below. Study it carefully and you will notice that there are 10 levels of VALUE. #1 is the lightest or white and it goes down by shades to #10 or black. You can make your own, but they are very inexpensive to buy and are made of heavier cardboard to last. The one below has little "holes" in each value. This is so you can place it over the color you are working on and determine the actual value of that color. No they won't match as the card is gray, but you will quickly see that one of the values will blend quite well with the color and thus establish that this is the value of your color. Just try it a few times with colors you may have on your palate and you will see it. It is important to get used to using it, again, as it is very important to be able to get the values right for proper depth. Note that it is very rare to use all 10 values in a painting. However, anywhere between five and seven is common. 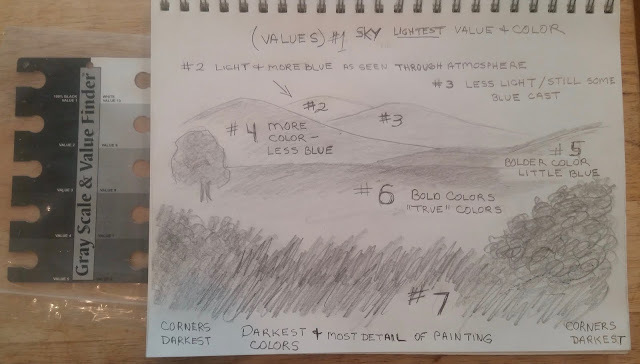 I have sketched a basic landscape and labeled the values. You see it below. Notice that the sky is the first value. It is of course the lightest of the colors on the canvas and it establishes the value system for the rest of the painting. It is ok to jump a couple of values from one to the next, but be careful not to go too many in one jump. two values is a good guide to use. Again, a good landscape averages 5 to 7 values, but an intricate one can have more. As you can see from this drawing, the sky is the 1st value. That is not to say that the sky is white! # 2 is the furthest mountain. It will be light purplish blue. If you paint it while the sky is still wet, softly blend the mountain color into the sky SOME and it will make it recede into the background even more! Beautiful! Next is #3 second mountain. It is 1 or 2 values darker. Still blue, but darker. #4 is closer so it will take on some more color and less blue, darker. #5 has mostly color and only slight blue to it. #6 is the back field area. Use lots of color here but not too dark. Many paintings have a lot of interest in this area. Lots of light and yellows etc. to draw the eye into the painting! Lastly #7 here has the darkest color and the most detail as it is closest to the viewer. The corners are the darkest of all. Here is your opportunity to have the viewer enter the painting. DON'T block the eye with tall grass all the way across, etc. Have a road, water, pathway open area or what have you to lead them into the scene. This is VERY important! This can be done with color tied into the middle #6 area also. BTW, the tree on the left is in the #6 area so don't paint it too dark! Contact me if you have any questions. But mostly, remember to practice, practice, practice! 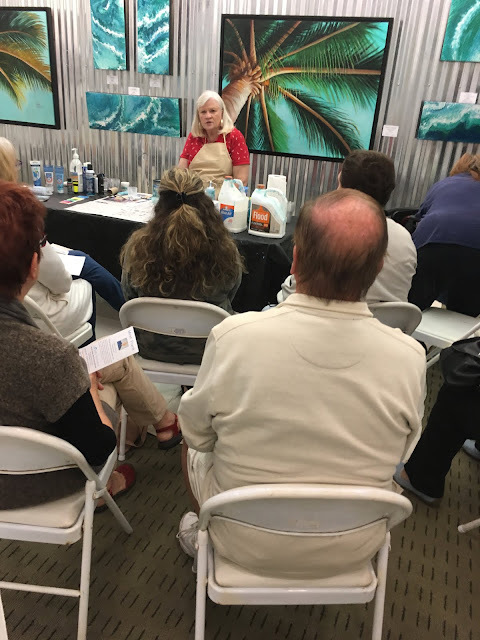 You WILL get it and you will see a big difference in your paintings! They will seem so much more real all of a sudden. YAY! Now, for my latest paintings. I wanted to do something moody and so I found a picture of a lady walking in the rain. I decided to make her walking through the woods in the rain. It is also foggy. I wanted REALLY moody, LOL!! Anyway it turned out quite well It is a fall scene so there are colors but they are muted by the fog. I painted her raincoat a bold color to draw the eye to her as the focal point (notice that it is an instance of a center focal point). I also painted puddles with rain splashing off them and footprints to draw the eye to her. 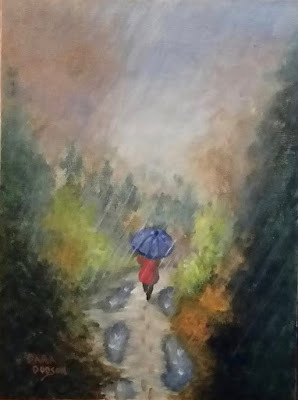 I called it "A WALK IN THE RAIN" Notice how the VALUE system is used here. Darkest in the front, especially in the corners. I am still working on my caribbean theme, but I got sidetracked while looking through reference material. I came across carnival dancers in the streets of the caribbean islands. 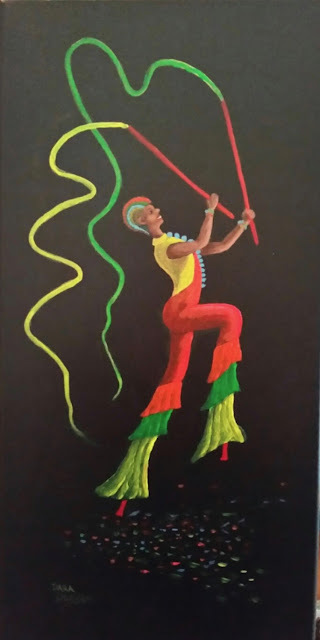 Many like to dance on stilts and they are so cool! I don't remember seeing any in paintings, so I thought, WHY NOT! I LOVE doing this, it is so much fun! I bought fluorescent paints and decided to start with black canvas. They turned out nicely, if I do say so myself! I have finished two smaller ones and am now working on a large third one. It is a square 24 x 24 canvas that I tipped up into a diamond. Neat huh! It doesn't take much to get original! I will have it done next week I think. It is more complicated than the first two. Put these under a black light and they will REALLY glow! Enjoy and once again, Thanks for Looking! I am still working on that colorful seascape. Well, actually, I am LOOKING at it. That's what you do when you don't like something but can't figure out what it is you don't like. 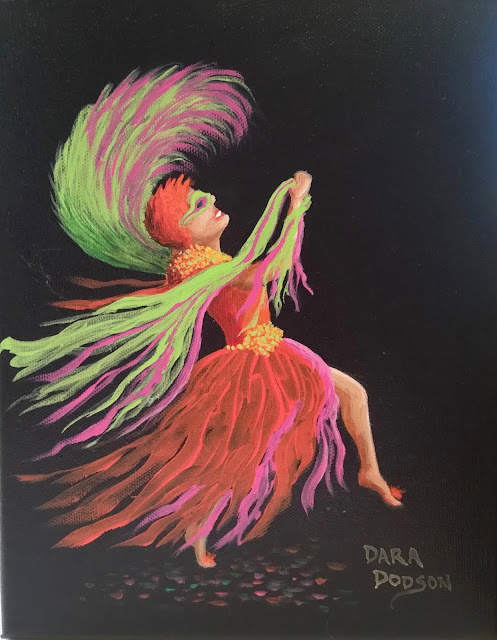 Just set it up on an easel or a shelf somewhere and keep looking at it from time to time and it will eventually come to you what you need to fix. I'm still waiting....oh well, that's how it is. NEXT WEEK I WILL TALK ABOUT PERSPECTIVE, OK? SEE YOU THEN!